I love window shopping; its what I spend at least half of my time on the internet doing, and of all the window shopping I do, most of that is for my dream home of the future. I know that’s probably a little way off, but a girl can dream, right? 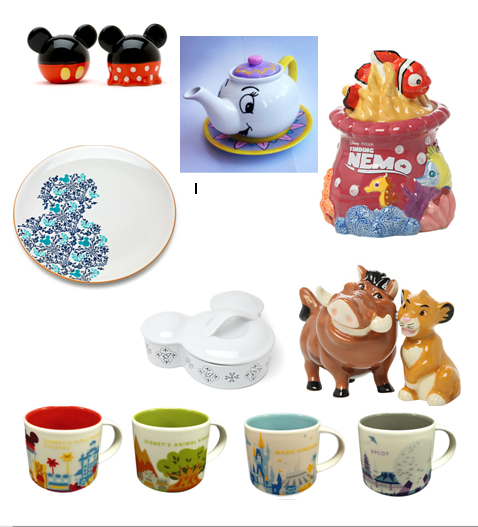 So today I’m featuring a few of my favourite goodies that add a bit of Disney magic to the kitchen! For someone who doesn’t drink tea or coffee, I own a lot of mugs, pretty much all of which are Disney, so I’ve tried to avoid looking at mugs, but I’m totally in love with the Starbucks ‘you are here’ mugs. You can only get them in the park they represent, and there are six altogether as you can also get ones for the California Disneyland parks, so I’m hoping if they’re still available I’ll be able to pick up each one in January! I also dream of owning a proper Mrs Potts and Chip tea set, so when I stumbled across this beauty on Etsy, I had to add it to my favourites. As well as great clothes, Hot Topic also has a great collection of Disney homeware. I struggle to choose favourites, but thought today I’d feature the Finding Nemo cookie jar and Lion King salt and pepper shakers. The Disney Store obviously has a fab lot of kitchenware, and the newly released Azul Dining Collection has definitely tickled my fancy; there are dining plates, bowls, mugs etc, but they’re selling quick! I also love the casserole dish, there was a similar one in the Disney parks. This entry was posted in decor, Disney, Disney Shopping, home, lifestyle, wishlist and tagged disney, home, kitchen, wishlist. Bookmark the permalink.